BhaGmati_Quli Qutub shah- Ek Hyderabadi prem kahani ~ Amazing ..!! Among the Greatest love stories of world, Our Indians have some marvelous stories to share proudly—One Story lies behind the worlds greatest wonder, Taj Mahal and the other story is About Bhagmati & Mohammad Quli Qutub shah. The Great Bhagyanagaram (Hyderabad) was named after Qutub shah’s Love and there is no tomb built.we must feel proud to be from such great land. Bhagamati was a native of Chichlam (now Shahalibanda Hyderabad), India. Muhammad Quli Qutub Shah, fifth sultan of the erstwhile Qutub Shahi Dynasty married Bhagamati in the year 1589 CE (Common Era or Christian Era) and presumably remained with her until his death in 1611. Muhammad Quli Qutub Shah built a city Bhaganagar in 1591 CE, to honor his love for Bhagamati, The city was built on the site of Chichlam (today known as Shahalibanda which was native village of his future wife, located 10 miles from Golconda Fort on the southern banks of Musi river. Muhammad Quli Qutub Shah renamed the city of Bhaganagar as Hyderabad after Bhagmati was conferred with the title Hyder Mahal, following her conversion to Islam, at the behest of Mir Jumla Mir Muhammed Momin. Quliyath is Bhagmati’s pet name. Muhammad Quli Qutub Shah initiated the construction of 'Charminar' (Four Minarets). Charminar is the exact replica of tombs of martyrs Imam Hasan and Imam Hussain at Karbala, known as Taboot, which is considered very sacred. While laying the foundation stone of Charminar, Mohammed Quli Qutub Shah and his wife prayed for welfare of the people in their contemplated new city. 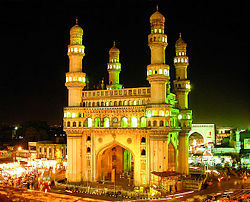 The structure of Charminar comprises four tall and massive minarets connected to each other by four high arches and this resembles the archetypal triumphal arch. This beautiful colossus in granite, lime, mortar and, some say, pulverised marble, was at one time the heart of the city. Initially the wonderful monument with its four arches was so proportionately planned that the beautiful Charminar monument could be impressively seen from the top of Golconda fort. One could even catch a glimpse of the bustling Hyderabad city as these Charminar arches were facing the most active royal ancestral streets.Muhammed Quli Qutub Shah had constructed many roads, several palaces. gardens mosques, sarais, shops. fountains etc. not only to beautify the city but for its well planned alround growth for his dream city Hyderabad.Though not scholarly educated, he has written poems in both Persian and Urdu , Persian being his first language besides Marathi. Mohammad Quli, is the young prince of the Qutub Shahi dynasty, One day when he was on his morning riding he passed by a temple where he sees a beautiful girl carrying flowers, garlands and other things required for puja. She was the most beautiful girl he had ever seen. Not just beautiful. There was a radiance and glow about her that seemed ethereal. She had looked up just for one moment and had met his glance. After that she quietly walked into the temple. But that magic moment had worked wonders. Prince Quli and the unknown beauty had fallen in love with each other! Prince Quli had no idea who she was or what she did. But he knew for certain that he had never felt this way for any other girl so it must be something quite special. But he was not ready to speak out his thoughts even to close friend,Zafar. Prince is fascinated to Music and Dance, After looking the girl he lost interest on everything and wished for a day to meet her again. Zafar, his close friend thought that the musicians and dancers are unable to impress the prince. So he says about a good singer on the other side of river musi and asks "Shall we visit the other singer tomorrow?" asked Zafar. "Perhaps," said Prince Quli without much enthusiasm. But when it was tomorrow he did not have anything particular to do, so he agreed to go across the river and listen to the new singer. As they entered the music hall, Quli’s heart missed a beat. The singer was no other than the beautiful girl he had seen at the temple! Her face lit up as she looked up and saw the prince. "Who is she?" Prince Quli asked Zafar. "She is Bhagmati, a famous singer. I’m sure you’ll like her." "No doubt I shall," said Prince Quli, gazing at her with love and admiration.Things took an obvious turn the moment Prince Quli met Bhagmati alone and told her of his love. He was impatient to know if she loved him too. "Yes" said Bhagmati fearlessly. "But what about your father? I’m a commoner and belong to a different faith. I’m sure he will not like it." "I don’t care," said Prince Quli. "You are the only one who matters to me, more than my kingdom, more than anything on earth." And they continued to meet, the prince making the long journey from Golconda Fort every night. He was so enraptured in her and her music that everyone noticed the change in him. The news reached his father and the reigning king, Sultan Ibrahim. He was livid with anger. "How dare he waste his precious time on a mere commoner?" he cried. "I’ve to stop him." "But how will you do that, your highness?" asked his ministers. "The prince is not a little boy and knows his own mind." "It has to be done," said the Sultan. "I shall confine him within the fort. He will not be allowed to step across. Let him find all the music he cares about inside my fort." The Sultan was true to his promise. Prince Quli remained a prisoner inside his own home and could no longer meet Bhagmati. He was very unhappy. And so too Bhagmati, although she took it to be her destiny. One night, Prince Quli could bear it no more. A fierce storm was raging outside the fort and it rained torrentially. So much so, nothing was visible. Prince Quli scaled the rampart and crept out of the fort. River Musi was in spate and the black waters swirled along fiercely. But Prince Quli never thought of himself or how dangerous the river could be. He jumped in thinking of Bhagmati alone. The rabid water lashed across his body and tossed him about throwing him on the bank after what seemed years. But at last he was on the other side where Bhagmati sat staring out of the window. "You!" she cried incredulously as Quli staggered in half dead. "I couldn’t stay away" he whispered as everything went blank around him. There was tremendous turmoil in the fort the next morning when people discovered that Prince Quli was missing. But eventually the Sultan got to hear all about it. He was silent this time and walked about restlessly. Finally he looked up and exclaimed, "He risked his life for the girl! He jumped into the mad, gushing water for her sake! I can’t believe it!" Finally he looked up and said, "It is true love, not a temporary fancy. I can’t keep them apart any longer. He shall marry the girl." 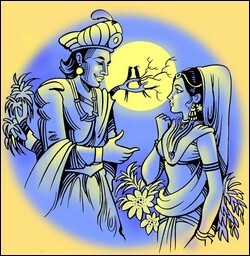 So Prince Quli and Bhagmati were married amidst great rejoicing. The Sultan renamed her "Hyder Mahal" and the city of Hyderabad came to be named after her.